Following on from its launch of the world’s first fixed blade Stubby VDE screwdriver, Carl Kammerling International has introduced the Stubby VDE slim screwdriver four pack, containing all four sizes of this clever little range of safe, slim, stubby screwdrivers, that guarantee the safety which comes from a VDE product. Following research with professional electricians, Carl Kammerling identified that most carry a non-insulated stubby screwdriver, despite understanding the importance of tool insulation. 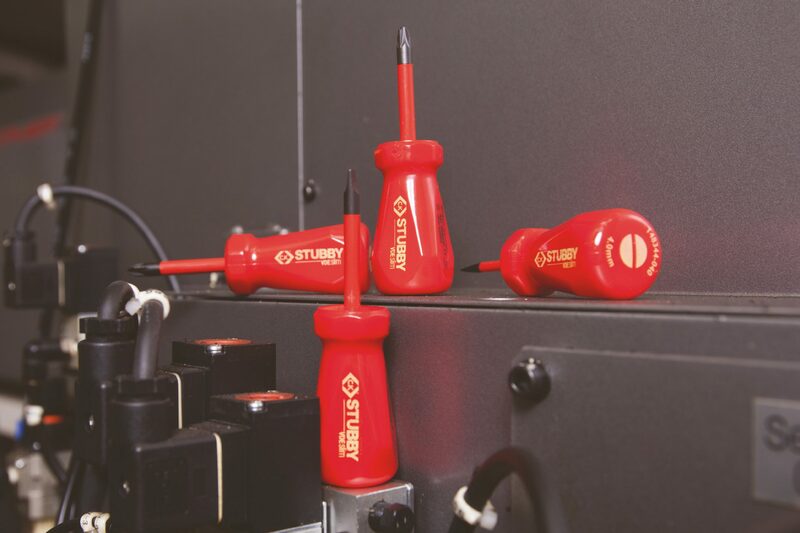 The C.K Stubby VDE slim screwdrivers filled this void, by featuring a shorter length (ideal for use in confined spaces) and full VDE approval, to provide the assurance that each product is individually tested to 10,000V for safe working up to 1,000V. Chrome vanadium steel blades are designed to provide strength and durability, whilst the slim shaft allows easy access to recessed screws and fixings. In addition, all four screwdrivers feature tip type markings for easy identification, together with anti-roll flats to prevent the screwdriver from rolling off sloping surfaces. Claire Griffiths, product and marketing executive at Carl Kammerling, explains, “The C.K Stubby VDE slim screwdriver range is proving a real winner and demand has been increasing for a set which contained all four sizes.